Little Thatch is a semi detached thatched cottage just a short walk from the beach in the Essex seaside town of Walton on the Naze. The cottage sleeps four people and has one double bedroom and a double sofa bed as well as a shower room. The cottage also contains a fitted kitchen and a sitting room. Outside the cottage is off road parking for two cars and an enclosed lawned garden with outdoor furniture. 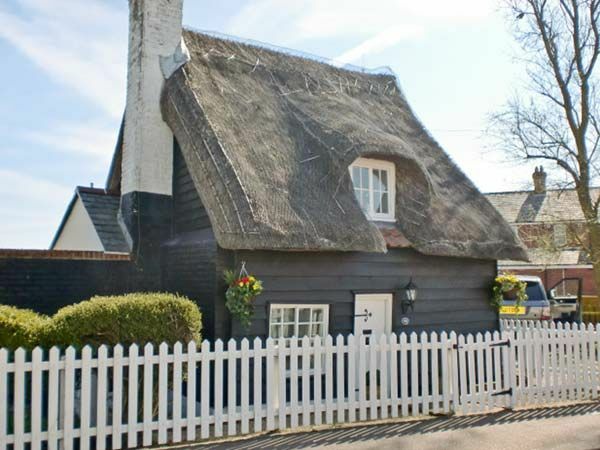 Perfect for a romantic break near the sea, Little Thatch is picture postcard cottage in a superb location. Amenities: Gas central heating. Electric oven, gas hob, microwave, fridge/freezer, TV with Freeview, DVD, selection of books, games and DVDs. Fuel and power inc. in rent. Bed linen and towels inc. in rent. Off road parking for 2 cars. Bike storage. Small terrace to front and enclosed lawned garden with patio and furniture to rear. One well-behaved dog welcome. Sorry, no smoking. Shop and pub 2 mins walk. Beach 2 mins walk. Note: This cottage has steep narrow stairs and is not suitable for the less mobile. Note: Max. 2 adults and 2 children aged 12 and under. Town: Walton on the Naze is a small Essex seaside town. It has a range of shops, bars and restaurants as well as a pier. One king-size double bedroom. Ground floor shower room with shower, basin and WC. Fitted kitchen with breakfast bar (seats 2). Sitting room with sofa bed. Gas central heating. Electric oven, gas hob, microwave, fridge/freezer, TV with Freeview, DVD, selection of books, games and DVDs. Fuel and power inc. in rent. Bed linen and towels inc. in rent. Off road parking for 2 cars. Bike storage. Small terrace to front and enclosed lawned garden with patio and furniture to rear. One well-behaved dog welcome. Sorry, no smoking. Shop and pub 2 mins walk. Beach 2 mins walk. Note: This cottage has steep narrow stairs and is not suitable for the less mobile. Note: Max. 2 adults and 2 children aged 12 and under. lovely petite thatched cottage, excellent location! could have benefited from a comfy sofa, that's the only thing we can say that's negative! lovely lovely place!